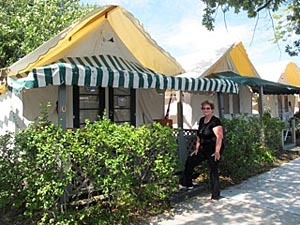 Coaster Photo – Coaster reporter Joanne Papaianni spent a week living in one of Ocean Grove’s tents. Last week due to my precarious living conditions, I had the good fortune of spending the week living in the tent community in Ocean Grove. I sold my house in Brick Township on July 20 and have been living out of a suitcase in my car while circling among my daughter’s condominium in Bayonne and friends in Bradley Beach, while waiting for the closing on my new house in Neptune. It’s been a rough summer, I’ve always had a place to lay my head down. The whole vagabond thing was getting kind of old when a colleague of mine took pity on me and offered her tent. She and her family were traveling overseas and would be gone for 10 days. Ater looking at the disarray in my car for the 15th day, the tent began to sound very inviting, especially because I work in Asbury Park. I had never actually been inside one of the tents though I had written many stories about them and had peeked in from the street once or twice. As fate would have it I was moving in just as the temperatures were climbing, reaching over the 100 degree mark the first fews days I was there. As it turns out there is a cabin part of the tent, constructed of wood and air conditioned and a canvas part that is built on top of a wooden platform. On the first night the tent section was so hot I couldn’t justify trying to cool it down by opening the door and pointing the fan in that direction so I just slept on the couch in the cabin. Other nights it was quite pleasant in the tent, where you here noises from the street, but which also gives the experience a communal feel. My first impression was what a great way to spend the summer. The cabin was decorated in white and gray and yes there was a full kitchen with a stove top and refrigerator but no dishwasher. There is also a bathroom and a separate room with a shower. Quite comfortable but just uncomfortable enough to make you begin to be grateful for being able to live in a house the rest of the year. Another major plus is being able to walk everywhere. No need to drive and with Main Avenue just two blocks away, tenters want for nothing. There are restaurants, ice cream parlors, a hardware store, a cheese shop and more. The downside – if you do want to go somewhere out of town from Friday afternoon through Sunday afternoon, when you come back you may have to park your car 10 blocks away, like I did. I did enjoy being able to walk over to Asbury Park for breakfast and take long walks on the boardwalk first thing in the morning. I often wondered about rain, but there was a storm while I was there and turns out it was delightful hearing the drops hit the canvas and smelling the cool rainy air. One truly charming thing about tent city and all of Ocean Grove is hearing the church bells ring in the evening. The first night I was there was Friday and at about 6 p.m. I began hearing the sound of familiar hymns filling the air. The bells also ring the time at the top of the hour, which I began to rely on to keep me organized. It was kind of nice not being distracted by cable news and TV shows. As soon as friends and relatives heard I was staying in tent city they all wanted to visit. My host had assured me it would be fine to have people visit so the first few days I felt a bit like a tent tour guide, but it was fun showing them around and sharing my adventure. Posted in Shore Communities and tagged Joanne L. Papaianni, Ocean Grove.